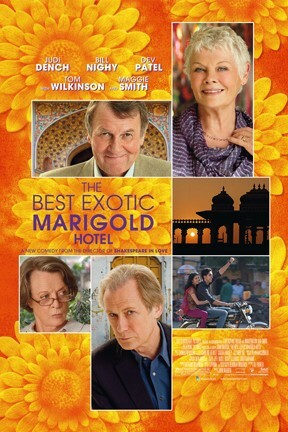 An assortment of aging Brits (Maggie Smith, Bill Nighy, Judi Dench, Tom Wilkinson, Penelope Wilton, Celia Imrie) respond to an advertisement for a luxurious retirement hotel in Jaipur, India, that turns out to be a picturesque dump run by an ingratiating young local (Dev Patel of Slumdog Millionaire). The witty script, Eastern locale, and tony cast may summon up memories of the old Merchant-Ivory films, and director John Madden (Shakespeare in Love) manages his prestigious players well enough that you may even find yourself lighting on phrases like "tradition of quality." I was often pulled out of the story by thinking how pleased the actors must have been to get this project, which may be another way of saying the movie isn't as good as its intentions. Yet Wilkinson acquits himself admirably in a highly uncharacteristic role, as a closeted gay barrister yearning to reconnect with the Indian man who was his first lover. Golden years travelogue goes against the summer movie grain. The Best Exotic Marigold Hotel is not showing in any theaters in the area.